Spring is the season many riders resume riding! It is a time to polish your boots, oil your saddle and get ready to enjoy the warmer weather! If your horse was constantly bundled during winter, he might have a few new blanket rubs. Before riding, make sure any new rubs aren’t near the saddle. Soothing aloe products, like Bag Balm, can help your horse’s skin heal. It is also a good idea to keep an eye on the temperatures during spring. The temperatures often fluctuate between night and day, so make sure your horse isn’t too cold or hot underneath his spring blankets. Whether your horse was active all winter or went for a barefoot vacation in the paddock, it is a good idea to have your farrier check his feet extra carefully in the wet spring weather. Make sure his hooves are trimmed and/or shod correctly, before starting any spring training. Generally speaking, your horse should have his teeth checked by an equine dentist twice a year. Did you know that dental checkups can also help prevent some training problems? When you are ready to begin riding, arrange for a dentist to visit to make sure your horse’s teeth are ready to have a bit in his mouth. As soon as the warmer weather arrives, check your immunization records or ask your veterinarian what spring shots your horse will need. Your vet will recommend shots that are based on a variety of equine factors, including: age, location, recent or future travel and any special conditions that might exist in your area. Staying up to date on your horse’s vaccines can help him stay healthy throughout the year. Spring is the time of year when the pastures tend to be filled with lush grass. As a result, the spring grass contains a high percentage of moisture and very little fiber. With this in mind, it is easy for horses to eat too much of the sugar-enriched grass. Limit your horse’s turnout time on grass, until it can become accustomed to the new grass. This tip goes hand-in-hand with tip six; before you begin a new, rigorous spring riding schedule, check your horse’s body condition. Is he in the correct weight category? Does he have a good muscle base? Has he experienced significant weight gain or loss during winter? 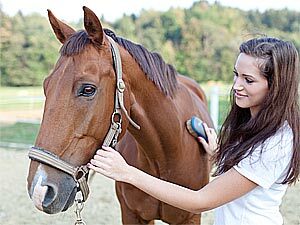 Understanding and keeping track of your horse’s body condition can help you to keep him in good health. It can also help you devise an appropriate spring training schedule. In spring, many riders get excited by the warmer weather and begin riding their horses regularly. While it is fun to ride almost every day, it is also important that equestrians keep track of their horse’s feeding schedule. Is your horse getting enough grain or high-fat rations to meet his new work requirements? Is his energy level appropriate for the work that he is about to do? If you discover you need to make any modifications to your horse’s feed, be sure to make the changes slowly. When in doubt, it is always a good idea to ask your vet for his opinion on your horse’s weight, body condition and feeding schedule. Caring for horses in spring requires horse owners to pay special attention to their equine partner’s body condition, energy levels, feeding schedule and general well-being. Staying organized and diligent in your observations can help you keep your horse happy and healthy this spring. Author Ashly Snell works in Dover Saddlery’s digital marketing department. Although known for their high-quality equestrian gear, tack and horse products that are available through their catalog and website, they also have a chain of Dover Saddlery Retail Stores. I didn’t realize just how important it is to stick to a feeding schedule with horses. I may end up getting a horse early next year, so that’s something I’ll have to be careful with. The last thing I’d want is to underfeed them.